Hello my friends! I hope everyone is enjoying their weekend-it's a cold and snowy one here in Upstate NY! A perfect day to stay inside and create! The weekly ATC challenge over at Wicked Wednesday is Winter Hats or Accessories. I decided to use Club Scrap's Shades of Winter kit and play along! Everything except the snowman is from the Shades of Winter kit. 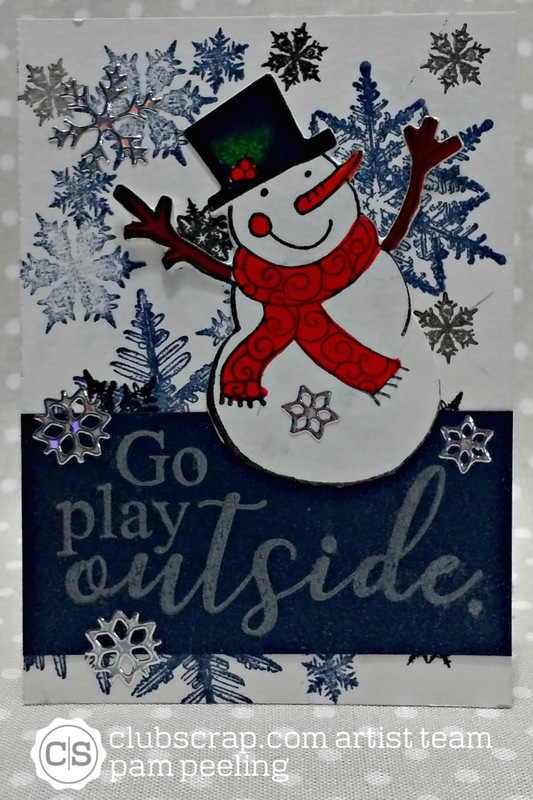 I stamped the background with snowflake unmounted rubber images from the kit in blue and black The sentiment was stamped in Club Scrap Metallic Silver ink onto the blue shimmery text weight paper in the deluxe kit. I love those sparkly snowflake stickers!! Make sure to check out the Wicked Wednesday challenge blog and link an ATC of your own! Pam this is just such an adorable ATC!! What a happy chappy your snowman looks, and he's dressed and ready to play. Thanks for joining in the fun at Wicked Wednesday this week.